This one’s all about the unexpected combos. Art grinds deer meat together with double-smoked bacon to create a juicy burger that tastes uniquely awesome. A chunky nettle pesto and homemade mayo merge into an indigenous aioli that’s paired with green tomato chutney to create the ultimate topper for this one-of-a-kind burger. It’s served up with yam fries and bannock, the perfect sides for a haphazardly, but fantastically seasoned meal. • Blanch approx 3 nettle plants and remove leaves from stalk. Strain and pat dry between 2 towels and chop finely on a cutting board. • Chop basil and mix in bowl with the chopped nettle. • Mix in 2 crushed and chopped garlic cloves and crushed hazelnuts. • Add two pinches of salt (unless you have really big hands) and pour in olive oil. Mix well. • Separate 3 egg yolks from the whites into a glass or metal bowl and add a pinch each of salt and dry mustard. • Begin whisking with an electric whisk until mixture is frothy (approx 1 min) then add vinegar. • Whisk until creamy then gradually start pouring in olive oil. • When desired consistency is reached add a few drops cold water and continue whisking for another minute. The mayo should turn from a yellowish color to a creamy white color. To make aioli, simply mix together the pesto and the mayo. Cover the bowl with plastic wrap and place in the fridge until ready to use. • Chop up nodding onion, sage leaves and white onion and set aside. • Grind deer chunks intermittently with smoked bacon slices in a manual grinder. • Mix the meat mixture until the colors of the bacon and the venison are blended then mix in the onions and sage until they are evenly distributed throughout the ground meat. Option- add an egg or a bit of oatmeal to the mixture to help it bind better if you wish. • Form a test patty by forming a round ball with your hands then pressing it down to a patty shape. If patty holds together, form the rest of your patties. If there is extra meat left you can put it in your fridge and cook it the next day. • Fry patties in an oiled skillet over medium heat. • Using organic yams means you don’t have to peel them. • Chop the tapered ends off of two large yams then slice one side lengthwise to create a flat surface on each yam. You now have a flat bottom to keep the yam from rolling while you cut them. • Using a sharp knife carefully cut ½ inch slabs lengthwise down each yam. • Placing each yam slab flat onto a cutting board you can now slice each slab lengthwise to shape your fries. You can also trim off any unwanted peel at this point since it is much easier to do than peeling a whole yam. • Place the fries in a sealable food storage bag with olive oil, sea salt and rosemary then seal the bag and massage the fries until they are coated with the oil. • Spread evenly on baking sheet and bake in the oven for 25-30 mins, remember to quickly flip the fries halfway through. • Just before the burgers and fries have finished cooking, slice the sorrel into thin strips and set aside in a bowl. • Toast your buttered buns open-faced in a toaster oven or oven set to broil and place on plate with the yam fries. I like to use baked bannock sliced open for this but you can use any good quality bread you like. Anything but those cheap pre-packaged hamburger buns will allow you to pick something with at least more fiber, nutrition and rib sticking substance. • Spread the aioli on the bottom bun along with any of your favourite condiments but be creative. Home jarred relishes & chutney can add a nice zing to your burger. OPTION- morels or other wild mushrooms fried in butter are also a great topping. • Place the deer patties on top of the buns with the aioli and add another small dollop of aioli on top of each patty. 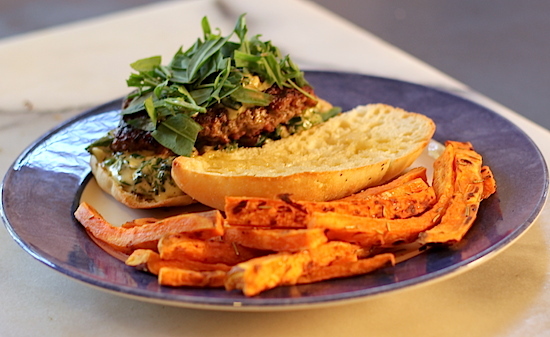 Place the sliced sorrel on top of this and serve the burgers while still hot!